Lactose free food for the dietary management of lactose intolerance, suitable from birth. 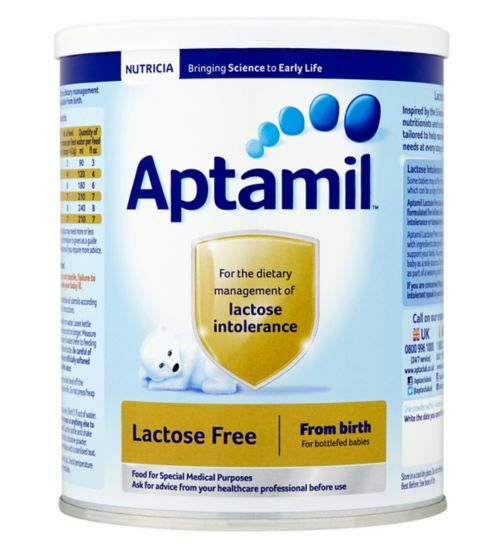 Aptamil Lactose Free is specially formulated for infants with lactose or sucrose intolerance or those suffering from diarrhoea, bloating or wind caused by temporary lactose intolerance. It is a nutritionally complete formula. You can use it to feed your baby as a sole source of nutrition from birth and as part of a weaning diet from 6 months to 1 year. Please see use and storage information on product.